An excellent kitchen appliance can create a difference with the quality of the food you serve on your table. Invest on high-quality kitchen appliances today. Upgrade your kitchen with the exceptional range tops, wine reserves, and many other kitchen appliances from Metro Wholesale Appliance in Houston, TX. We will help you pick out appliances that are suitable for your home or business. Improve the functionality of your kitchen with the outstanding appliances we have in store for you. With our outstanding kitchen appliances, your 100% satisfaction is guaranteed. 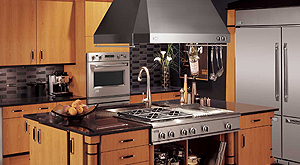 Contact us today to learn more about the kitchen appliances we offer. Our competent representatives can assist you and provide answers to your questions. You can also download our factory service numbers list by clicking on this link. CONTACT YOUR BUILDER SPECIALIST OR SHOWROOM MANAGER FOR YOUR SPECIAL QUOTE TODAY! Saturday mornings only by appointment. We are closed on New Year’s Day, Memorial Day, 4th of July, Labor Day, Thanksgiving (Thursday and Friday) and Christmas Day. Copyright © Metro Wholesale Distribution, 2019. All rights reserved.